An early start for our divers this morning diving the Um El Faroud, down at Zurrieq. At 8,30 the truck was loaded and our customers were ready to leave. A good day to finish off your diving Holiday, I would say, for our Italian friend Rene. He’s been here many times now and he’s already planning to come back in September and I wouldn’t be surprise to see him on a tech 40 course this time…we’ll see!!! 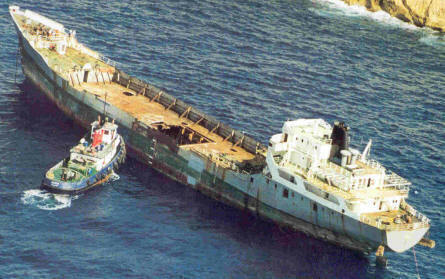 Now, let’s go back to our wreck and let’s take a look at what we might find during our dives.Wrecks, as artificial reef habitats, have provided a home for a greater number of species in recent years and make excellent dive sites. Also, the combination of sheer cliffs, caves, wrecks, shelves and sandy and rocky sea beds, means there is a large variety of fauna and flora to see in the Maltese waters. The John Dory, also known as St Pierre or Peter’s Fish has a thin, oval body with long dorsal spines and a wide mouth; it grows up to 90 cm in length and can reach a weigh of up to 20 kg. There is a dark spot on each side of its yellow to olive-green body. The dark spot is used to flash an ‘evil eye’ if danger approaches the John Dory. John Dory are coastal fish, found on the coasts of Africa, South East Asia,New Zealand, Australia, the coasts of Japan, and on the coasts of Europe. They live near the seabed, living in depths from 5 metres to 400 meters. They are normally solitary. 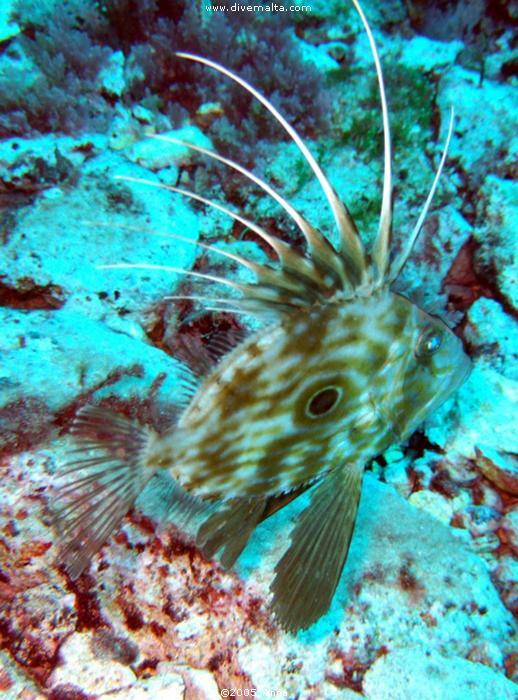 The John Dory eats a variety of fish, especially schooling fish, such as sardines. Occasionally they eat squid and cuttlefish. After they are 3 or 4 years of age they are usually ready to reproduce. This happens around the end of winter when they release sperm and eggs into the water to fertilize. Grouper belongs to one of the largest fish families (over 400 species) in the Sea, the Sea Bass family (Serranidae). Groupers are teleosts, typically having a stout body and a large mouth. They are not built for long-distance fast swimming. They can be quite large, and lengths over a meter and weights up to 100 kg are not uncommon, though obviously in such a large group species vary considerably. They swallow prey rather than biting pieces off it. They do not have many teeth on the edges of their jaws, but they have heavy crushing tooth plates. They habitually eat fish, octopus, and crubs. They lie in wait, rather than chasing in open water. The Flying Gurnards lives on muddy, sandy, and rocky bottoms. When threatened it quickly opens its huge, fan-like pectoral fins. At least one observation has shown that this behaviour can indeed deter predators. 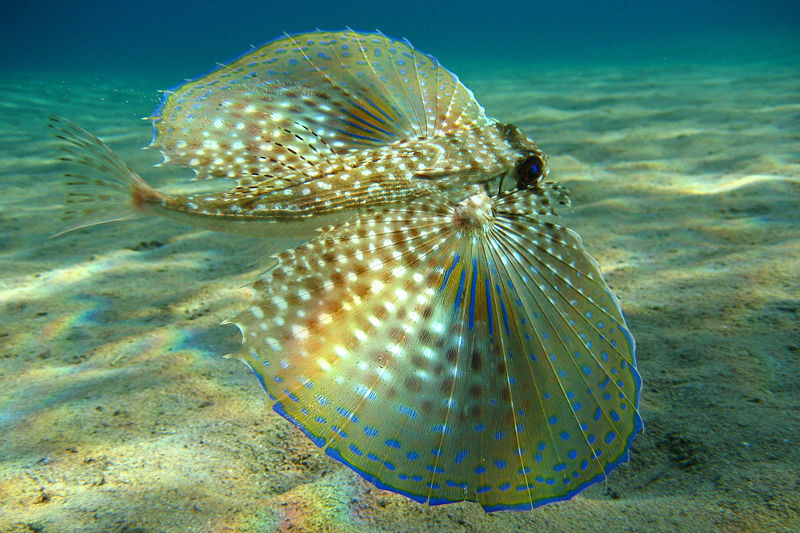 Normally, however, the pectoral fins are folded against the sides and the fish “walks” on its ventral fins. Despite their name, flying gurnards do not actually fly through the air as do flying fishes (family Exocoetidae). is a cephalopod mollusc of the order Octopoda. Octopuses have two eyes and four pairs of arms, and like other cephalopods they are bilaterally symmetric. An octopus has a hard beak, with its mouth at the center point of the arms. Octopuses have no internal or external skeleton (although some species have a vestigial remnant of a shell inside their mantle), allowing them to squeeze through tight places. Octopus are amongst the most intelligent and behaviorally flexible of all invertebrates. They have numerous strategies for defending themselves against predators, including the expulsion of ink and the use of camouflage. They also have an ability to jet quickly through the water and hide. An octopus trails its eight arms behind it as it swims. 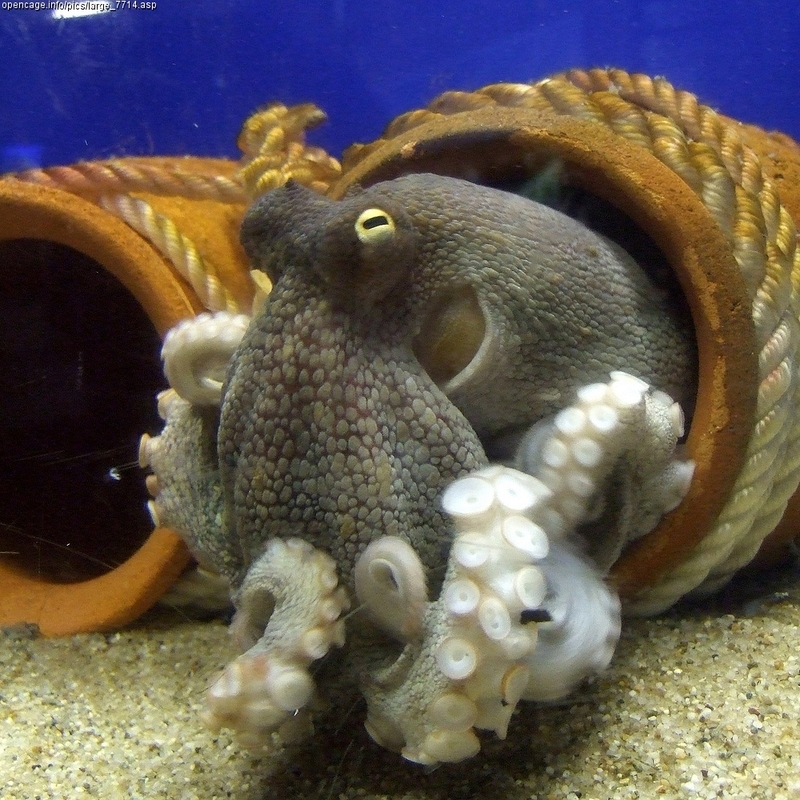 Octopuses are highly intelligent, more than any other order of invertebrates.The exact extent of their intelligence and learning capability is much debated among biologists,but maze and problem-solving experiments have shown that they show evidence of a memory system that can store both short and long-term memory. It is not known precisely what contribution learning makes to adult octopus behavior. Young octopuses learn almost no behaviors from their parents, with whom they have very little contact. Octopuses move about by crawling or swimming. Their main means of slow travel is crawling, with some swimming. Jet propulsion is their fastest means of locomotion, followed by swimming and walking. This species has excellent camouflage; it is able to change its colour to match its surroundings. Despite their name, cuttlefish are not fish but molluscs. 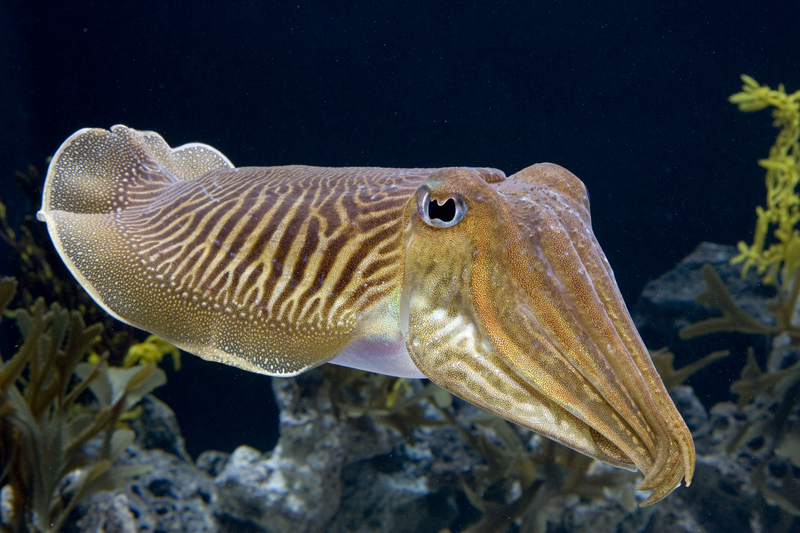 Cuttlefish have an internal shell called cuttlebone, large W-shaped pupils, eight arms and two tentacles furnished with denticulated suckers, with which they secure their prey. The common Cuttlefish lives in sandy to muddy bottoms in 1-200 m. Females deposit up to 4000 grape-shaped eggs that hatch after 30 – 90 days. The 8 mm hatchlings feed on caprellids during the first three months. Females born in spring spawn already in autumn, while females born in autumn spawn in spring the following year; thus two cycles alternate. Females die after spawning, while males may live up to 2 years. 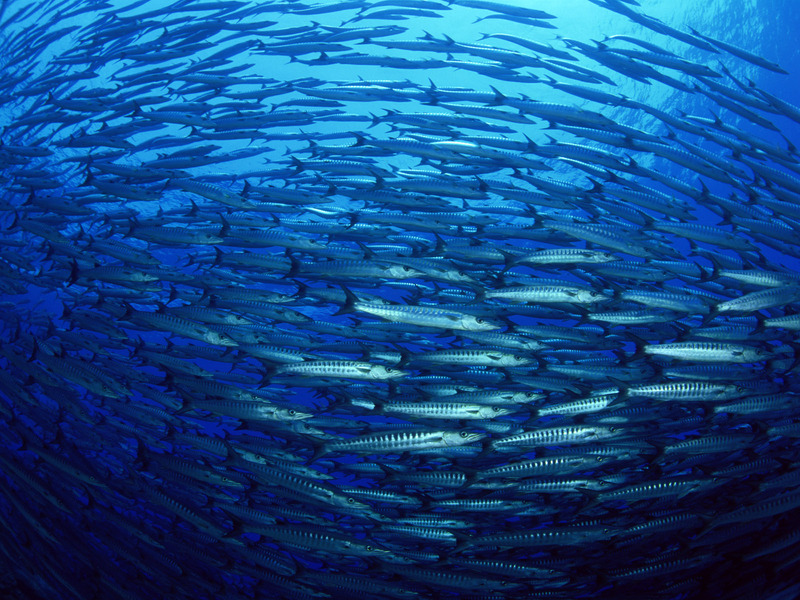 Main diet are small crustaceans, shellfish, small fish. There are a few sea animals to watch but not handle as they have vicious or poisonous bristles and spines. Keep your eyes open for the scorpion fish, bristleworms, sea urchins and the stingray. If you do step on or touch one of these fish, seek medical attention as your reaction to the injury will depend on your general medical condition and age.